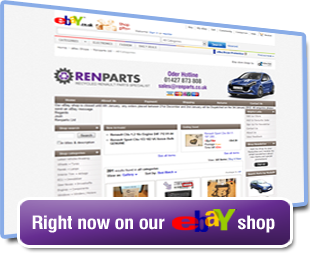 At Renparts we pride ourselves on the quality of our used parts. Each vehicle is dismantled completely when it enters our premises, leaving nothing open to the elements and ensuring the quality of the parts. Once the part has been removed from the vehicle, its entered in to our computerised stock system. The main advantage for our customers is that every part can be traced back to its original source vehicle, meaning the age and mileage of each part is available. Each part is cleaned, inspected and tested, then barcode tagged and scanned into its shelf number location, this allows us to locateeach part quickly for mail order dispatch or customer collection. All used parts carry 3 months warranty as standard, this can be extended up to 3 years. For further information see our Warranty Page. Using recycled parts helps the environment, due to less new parts needing to be manufactured, meaning you can save the environment while also saving a fortune. Why not contact us today? And save up to 80% on main dealer prices.